“Be prepared” might be the scouts motto, but it could just as easily apply to Fabiano Caruana’s performance in the 2018 Candidates, where he outclassed the rest of the field, won comfortably in the end and qualified to take on the reigning World Champion, the Norwegian Magnus Carlsen, in a match that will take place later in the year in London. When Lawrence Trent, Caruana’s former manager, told me in Facebook chat just before the tournament began that Caruana had been preparing harder than ever before, it felt significant. And it turned out to be so, because right from round one the tone was set. Caruana simply blew Wesley So away playing typically “Caruana chess”; very sound strategically, but with more than a hint of aggression (19.Ng5!). Caruana executed the final blows in that game with such speed and assurance, that it immediately became clear to me that this was indeed a player who was extremely well prepared. When you’ve been working hard at home, somehow it makes the job required on the board so much easier. Gone was the somewhat fragile and spotty Caruana of the last 2-3 years. No this was surely the 7/7 Sinquefield cup Caruana, a player indeed capable of not just humbling some of the best players in the world, but also putting it up to the mighty Norwegian himself. Caruana will be delighted to qualify as it prove thats his hard work ethic has paid off. Sometimes you can prepare as hard as you like for a tournament but the cards just don’t fall your way; so it’s nice when it actually turns out like you intended to. The key game for Caruana was the round four game against Kramnik. Once again in that game he displayed his abilities as a grinder; you could point to Kramnik’s collapse later in the ending but the fact is that you have to give the guy a chance to mess up. By showing a high level of resistance and trickiness in that endgame (for example, 58…Nf3! which was immediately met by a terrible blunder 59.Rd1??) he gave Kramnik that opportunity. There’s no doubt that Caruana is an exceptional calculator. There’s no way you’d be able to find all these tricky moves deep into the game if your play wasn’t backed up by an exceptional calculating brain. The game with Kramnik was so key because not only did he hamstring a significant rival, a rampaging Krambo, but at the same time he also got to a healthy +2. Being on a decent score early on gave him the kind of breathing space that some of the other players simply never enjoyed, and he would have immediately been thinking that this was a natural consequence of his serious preparation for the event. What also impressed me with Caruana was how well he handled losing to Karjakin later on. As a competitor, deep in the mists of battle, it would be very easy to become disillusioned to lose at such a late stage in the tournament. I’m sure this loss made the otherwise mild-mannered Caruana very angry, because he would have felt that he lost control of the tournament, yet at the same time he didn’t panic and delivered in the last two rounds two very accomplished games to seal qualification. Although ultimately Mamedyarov will be disappointed not to qualify, I think when he reflects on this tournament in a few weeks time he will realise that in fact he played exceptionally well, and was probably simply unlucky to run into a player in Caruana who was playing equally as well as he was. That’s the problem you face sometimes when you are competing at a high level. You can do everything correctly, everything well but there’s just this other guy who’s doing the same thing and just a bit better than you are. I think when you look at Mamedyarov’s games from this event though, you wonder if he tried to play too correctly. I think it’s a shame, because what it says is that you can’t play like this anymore. You can’t play like Tal, because the human calculating machines that operate in the highest echelons of world chess will pick you off with their computer-like play. We saw Shak essaying and defending the Catalan on both the White side and Black side, and a lot of his games ended up in dry and boring positions where it was difficult to win. Normally that wouldn’t have been a problem, because +2 in most Candidate events might have been good enough to qualify, but it wasn’t good enough in this one. In future Candidate tournaments I’d like to see a return to the old Shak that the chess world has come to know and love. In some ways this urge to turn yourself into a more efficient, more accurate player, but at the same time sacrificing some of your brilliance. It reminds me of a conversation I once had with former Snooker pro Steve Rush. He was talking about snooker players like Marco Fu and how being coached by Terry Griffiths had turned them into boring players, when before they’d been out and out attacking players. It seems to me that being a chess player is more than just results; somehow you have an obligation to entertain the public. That can easily be lost in the overriding desire to achieve the best possible score. At the point in the tournament where Karjakin defeated Caruana, I thought of myself as some sort of soothsayer, as I suggested in my preview that it was unwise to underestimate the Russian former title challenger, as he was uniquely suited to this type of event. Alas for Sergey fans, that was as good as it got; although he had battled back well from -2 he had very little left and was only able to get third place. There seemed to be a lot of people picking up on this theme of being horrified by a prospect of a Carlsen vs Karjakin return match, based on the logic that the first one had been incredibly boring (which it was), though I wasn’t so bothered by such a prospect; mainly I think because Carlsen would have been hugely motivated to squash him in the return. And that in turn might have lead to more exciting games. Now it won’t happen, so any speculation is irrelevant anyway. The key turning point in Karjakin’s tournament was the win in round seven against Wesley So. This “stopped the rot”, so to speak, and seemed later in the tournament that it might have been the most significant win of all. That game showcased Karjakin’s ability to just keep going, a skill which as we have seen which is so significant in top-level chess right now. He also showed the same skills against Aronian in round 11, although by that stage the Armenian player was completely devoid of confidence as he showed very little resistance in the endgame. Some might suggest that Karjakin didn’t play well enough over the course of the tournament and was flattered to finish so close. They might well have a point, but the truth is I think Karjakin is an underestimated player in general. He has a very good all-round game and calculates simply and quickly. I think that with the exception of Caruana, Ding is the player who will go away from this tournament most contented. Quite simply with this performance, Ding put down a serious marker for the 2020 Candidates. Going into Berlin he would have been one of the least experienced players; perhaps not so much in terms of playing at this level, but more in terms of dealing with the exceptional tension that such an event, with so much on the line, gives rise to. I recall saying to Maurice Ashley at the London Classic a few months ago that I felt Ding had a chance, and he looked at me like I was crazy. I don’t think anyone will be underestimating Ding now and I have to admit that it was IM Richard Pert who first tipped me off about Ding and his great potential. He even suggested some years ago when Ding was a little known player, that he would rise to the very top. Richard has spent time in China and according to him, when he was there it became clear that Ding is something of a national hero and is always getting mentioned on the television. I can only see him kicking on from here and continuing to improve. In my view, assuming he gets there, he will be one of the outstanding favourites for the 2020 Candidates. Ding was the only unbeaten player and his sharp tactical eye came to the fore on many occasions during the tournament (for example 27…h3! Against Karjakin in the last round, the strength of which was missed by both the commentators and his opponent) and his only disappointing miss would have been against Grischuk in round 11, where he built up a completely winning position only to miss a crushing blow with 29.Nd8!, which would have ended the game at once. 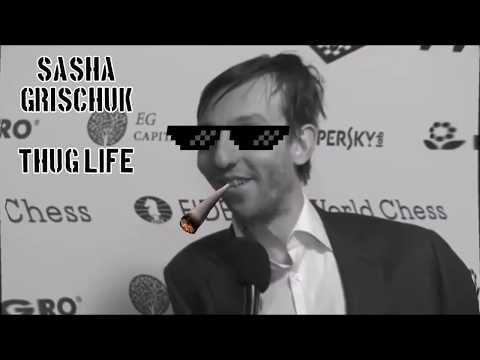 Grischuk built up a bit of a cult following during the event, which was mostly down to a “Thugstyle” tribute video someone had compiled on YouTube, of some of his more humorous outbursts. If you have a spare ten minutes, check it out below. Grischuk seems to me to be one of the more normal of the top players, but he never really got going in this event. Although he did bounce back from the early loss to Kramnik, it seemed that he was stuck around fifty percent and +1 for too long, was lucky to escape against Ding and any lingering hopes he had were firmly extinguished by Mamedyarov in the penultimate round. The problem in my view that Grischuk has is that he lacks a “big weapon.” You could point to Caruana’s accuracy, Kramnik’s huge self-confidence, Aronian’s creativity and Karjakin’s ability to keep going, and while it seems to me that Gris does everything pretty well, there’s nothing that he’s truly exceptional at. Perhaps I’m being harsh here, and you could certainly suggest that he’s far more exceptional at all aspects of chess than I am, but that’s just the impression that I get. I wonder if Grishchuk is at a crossroads in his career. The problem is that he’s good enough to be a contender, but is he good enough to be the absolute champion? And if he does have a great strength then it’s surely his nerves, and they will only get worse as he grows older. I wonder if he’ll somehow fall away from the top level like other Russian players Peter Svidler, who seems better known as a commentator these days, and Alexander Morozevich. I hope not because I think his presence adds greatly to these events. I just wonder if he’s one of the more vulnerable players in terms of not being certain to qualify for the 2020 candidates. Have we just witnessed Sasha’s last shot? Certainly one of the more interesting performances of the event, if not of all-time! The Kramnik hype went into overdrive after round three, when he defeated Levon Aronian in stunning fashion. Plenty of people after that brilliant win were suggesting that this was now over, the tournament was pretty much done with and Big Vlad would surely qualify to play Magnus. This was indeed “hype”, as the next game showed when he was ruthlessly dismissed by Caruana. Some commentators made the point that the win against Aronian made Kramnik over-confident, which meant that he lost his objectivity and pushed for a win in positions where it was not wise to do so, and so on. I’m not so sure. My own personal view is the reason why Kramnik didn’t just kick on and win the tournament after the Aronian game, is because the strength in depth in world chess is significantly higher than when he won the world championship in 2000. Ok I know Vlad didn’t qualify to play Kasparov via a Candidates tournament (in fact he didn’t qualify at all, losing a match to Shirov beforehand and was only given the exemption because Kasparov preferred to play against Kramnik), but I think if he had done so, and defeated someone as strong as Aronian in 2000, then we would have seen a different scenario developing. Back then, you have had a breather for two or three rounds. You can catch your breath, and think “well I’ve got one or two low 2700 guys, or maybe high 2600 guys, before I get the next toughie.” Unfortunately for Vlad, that is no longer the case. He beats Aronian, and the very next game he faces someone just as strong, and equally as motivated, in Caruana. If we look at the situation objectively, then it’s going to be very hard for Kramnik to ever qualify for a World Championship match again. He’s competing with players 15 years or more younger than him. You could point to Korchnoi, who qualified for world championship matches in his late forties and early fifties, but again that was a different era. Korchnoi didn’t have to compete on level terms with 2800 players who are in their mid-twenties. And that’s the task facing Vlad. Looking on the positive side, Vlad went for it in almost all his games, although I wonder if this strategy was at least partly motivated by a sort of desperation, an inner acknowledgement that perhaps he had to roll the dice early, to build up a buffer so that when he reached the final few rounds, he would have enough of a lead so that the greater energy that the younger players would presumably enjoy at that point wouldn’t have helped them. Except that strategy backfired as he lost far more games than he would do usually. Although I’m sure Wesley will be bitterly disappointed by his performance, he’s still very young. He’s a little bit like Ding in that he lacks experience in playing in Candidates tournaments. There’s not a lot else to say about Wesley’s performance. As he’s so young, he could well have another five of these events to play in. The one game he lost where he really should have got a result was the game against Karjakin. I think that showed that even these super-talented young players can have huge weaknesses because he lost a position that should have really ended in a draw; his knight was slightly misplaced, but at this level you should not be losing such a game. It was a big gift. In some ways this demonstrated to me why Karjakin’s display in the last world championship match was so impressive. He was able to save many positions that even other super grandmasters would have crumbled in. No question Aronian’s performance here was the surprise of the event and not a good one for his fans. He struggled throughout, losing many games that he would have held comfortably under normal circumstances, which can only lead to the impression that there was something seriously wrong. Whether he was suffering with a cold, or just finding the weight of expectation difficult to handle, isn’t exactly clear. I do think the game with Kramnik had a really severe effect on his confidence. It’s fine lines at the top level and if he had won that game, we might have seen something completely different, he would have suddenly got confident and we would have seen the flowing, creative chess that is his hallmark. To lose so badly with White, even against such a strong opponent, must have had a humbling effect and it showed in the rest of the tournament. I also feel that as in the case with Kramnik, qualifying for the world championship final will not get easier with time. He only has a couple of Candidate tournaments before he hits his mid-forties, and can you really see someone making a World Championship breakthrough at that age? For Aronian, it needs to happen soon, so assuming he qualifies for the next edition he needs to make sure he gets everything right. I think the first thing that he needs to do is to make sure he takes the pressure off. Somehow you get the feeling that Aronian should have qualified for a title match by now. It seems like his play over the last 12 years easily deserves it and yet somehow he hasn’t managed to do it. It’s not just one tournament. Berlin is a particularly bad example but he’s failed at this stage before. He just needs to find a way to make sure it doesn’t happen again, but at the same time avoid putting pressure on himself. How can you prepare seriously for an event and then not take it seriously? it’s a hard thing to do, and we are often faced by these problems when we compete. I just hope for Aronian’s sake that he finds a way because I’m sure he will be personally devastated by the way the tournament turned out. As stated in my preview, Caruana was one of the players who I felt would have outstanding chances of defeating Carlsen in a match. Despite the Norwegian more than holding his form at rapid and blitz chess over the last few years, his performances at classical chess have been inconsistent to say the least and must fill the Italian-American player with a great deal of confidence. Colm Daly, an experienced international player for Ireland, seems to think Caruana’s victory in the upcoming match with Carlsen to be almost inevitable, suggesting that it’s about an 80 percent chance. While this seems wildly optimistic, it’s hardly sensible to think that Caruana is not going to give Carlsen some serious problems. Caruana doesn’t take as many risks as Carlsen, and he’s not as brilliant, yet he’ll just keep playing his consistent and hard to beat chess and if Carlsen is unable to shake himself out his slumber, that could well be enough. I think the match is still on Carlsen’s racket. A lot depends on him, his mood and how motivated he is to take down Caruana. If he truly doesn’t care, he’ll surely lose. And he should care, because the last thing he wants is to play in the 2020 Candidates, and have to go through all that again just to win his title back. That I believe, would be a complete disaster for Carlsen. He’s too strong to fade away.